Industrial Ovens & Industrial Furnaces | Charles A. Hones, Inc.
Charles A. Hones, Inc. has been a leading manufacturer of quality heating equipment since 1911. We are proud to offer our very own Buzzer Fire-Box line of furnaces equipped with the Venturi burner, an energy-efficient answer to your heat treating needs. From fine stock come endless varieties. The versatile Buzzer Fire-Box family of furnaces includes a range of models easily tailored to meet the individual needs of customers with diverse applications. 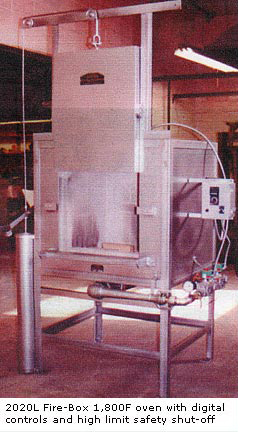 Some of our recent Fire-Box modifications, pictured throughout this issue, include furnaces for both moderate (1,800 F) and high temperature (2,150 F) applications, as well as furnaces equipped with air-operated doors and roll-out quench tanks. For more than 50 years our Fire-Box type furnaces, sold primarily as “#57”s, have been popular in both the fields of investment casing (dental, jewelry, and industrial) and heat treating (hardening, pack carburizing, and annealing.) They are also often used for tempering, assay work, low temperature kiln work (cone 06 and lower), enameling, pre-heating, glass work, and forging. All Fire-Box style furnaces come equipped with our Buzzer Venturi style gas burners. Our standard Buzzer equipment offers simple piping and requires only low (household) pressure gas with no blowers, no compressed air, and no forced exhaust. Our furnaces require only universal 120v/60Htz electric power, which greatly simplifies the installation of microprocessor-based temperature and ignition controls: just plug in and go! Stock models come with quality industrial firebrick insulation and counter-balanced guillotine-style doors, and are rated from 500F to 2,150F. Compared with other natural draft burners, a Venturi burner is significantly more efficient because it utilizes its physical design to accelerate gas flow and facilitate fuel-air mixing. When fuel passes through a constriction, it naturally speeds up through the narrow passage, provided that the amount of fuel is held more or less constant. Another advantage of using Venturi burners is that they can be operated even in the absence of electricity. Additionally, because furnaces with Venturi burners do not require blowers, they are much quieter than forced air burners. The real beauty of the Fire-Box family is how readily the stock models welcome modification. We can make them taller, wider, downdraft, fiber-lined, or rated for higher temperatures. We will be happy to assist in designing the best furnace for your customer’s needs – it might very well be a modified Buzzer Fire-Box!